Do you enjoy craft beer? Do you enjoy hiking, climbing and other outdoor activities? Do you enjoy buying your outdoor gear at a good price, all while helping raise funds for Washington’s National Park Fund (WNPF)? If you answered yes to any of these questions, then Two Beers Brewing Company (CBM Sponsor) has an event coming up this weekend you might be interested in. This Sunday, April 20th, Two Beers Brewing kicks off their 4th Annual Beer + Gear sale to benefit WNPF. Last year they raised over $25k, and they’re hoping to outdo themselves this year. Don’t need any beer or new gear? No problem. You can still make a donation to help out WNPF. Details below. Cycling is huge in the Northwest. Far more than just a recreational vehicle, bicycles are the primary mode of transportation for many people around the Puget Sound. That’s a big part of the reason that Chainline Brewing Company in Kirkland is so cycle/outdoor activities-focused. Their name was inspired by the active, outdoor lifestyles that are so prevalent in the Northwest and their brewery and taproom is located right next to the Cross-Kirkland’s bicycle corridor. Now, I’m not much of a cyclist myself, but that doesn’t mean I can’t enjoy their beers all the same. Their most popular offerings include their Tune Up IPA and their Polaris Pilsner, which won a Silver Medal at the Great American Beer Festival in 2017. Perhaps you’ll even find a few new favorites from Chainline this weekend, as they prepare to celebrate their 4th Anniversary with the release of 4 different styles of a Saison from their Old Growth Series and the return of some of their most popular offerings from the past. I don’t know about the rest of you, but I’m a big fan of Sour Ales. That puckering tartness they impart can be too much for some, but it tickles my palate’s fancy and I’m always ready to try a new Sour Ale. We have some great local breweries that make some truly amazing Sour Ales, but most of them are relatively new. Before their existence, the best Sour Ales around always came from Cascade Brewing Company out of Portland, Oregon. Cascade is still tops in my book. They’re one of my favorite Northwest breweries (as my #FF tweets can attest to), and I always keep tabs on what they’re working on next. To that end, I’m pleased to share the news with you that Cascade has released their One Way Or Another 2017 project. The 2017 version is a complex Sour Ale featuring Northwest-grown marionberries and Meyer lemon zest with Sour Blond Ale aged in oak barrels for up to 16 months. Festivals are a big part of the craft beer World, and a great way to discover new beers and new breweries. New festivals seem to pop up nearly every year and some, including myself, might say we’re starting to get too many. I have a lot of respect, however, for the festivals that helped start the craft beer festival craze and the Oregon Brewer’s Festival, which has been running for more than 30 years now, is definitely one of them. We have great craft beer here in Washington State for sure, but we also recognize that there is a plethora of craft beer awesomeness coming out of our neighbor to the South. Showcasing all that embodies craft beer (and cider), this year’s Oregon Brewer’s Festival is set for July 24th thru the 27th. A hot dog and a beer or soda have always been the quintessential food and drink of baseball. Throw in some peanuts and Cracker Jack and… well, and you might think this piece is being written by some old geezer from the 1940’s. Not quite. I don’t know if 50 qualifies me for geezer status just yet, but I can still fondly remember the days of my youth when a hot dog, a soda (hey, I wasn’t always drinking age!) and a box of Cracker Jack were a big part of what I looked forward to when attending a game. Things have sure changed, especially at T-Mobile Park (formerly Safeco Field), where your game time food and drink options have become decidedly more gourmet. The food and beer selection at T-Mobile Park has been called some of the very best in the nation. That’s a big reputation for this seasons newcomers to live up to, but I think they can handle the challenge. Are you an avid runner, cycler, etc? If so, what do you use to quench your thirst and get your electrolytes back in balance after a hard workout? You may have heard that beer can actually serve as a very worthy replacement to sports drinks as a recovery beverage. Apparently, Boston Beer Company (Sam Adams) heard this news as well and wanted to take the idea even further. So, say hello to Boston Beer’s newest project: Marathon Brewing and their first offering, 26.2 Brew. This beer has actually been available for the past seven years in and around Boston during the Boston Marathon, but now Boston Beer Company/Marathon Brewing want to bring 26.2 to the rest of us. I wasn’t always a fan of Sour Ales. They weren’t a big thing when I first got into craft beer back in the 80’s but, since first discovering them several years ago, I can’t get enough. Super sour or just mildly tart, fruited or not, I’ve come to appreciate a wide variety of Sour Ales. They weren’t the first Sour Ales I’ve ever had, but I’ve enjoyed just about every sour offering from Firestone Walker Brewing Company‘s Barrelworks series. Each year they keep expanding their wild/sour portfolio and this year is no exception. Say hello to the newest offering from Barrelworks: Bretta Tangerine. Brewed with Murcott tangerines, Bretta Tangerine is the latest beer to build on Barrelworks’ signature Bretta Weisse base beer. Yesterday evening, I attended a preview event for Seattle’s newest brewery, Best Of Hands Barrelhouse. I first told you about Best Of Hands back at the end of January, when they announced their opening date of Friday, March 8th. Since then I’ve been eagerly anticipating the opening, and with good reason. These guys really know what they’re doing, and the beers I enjoyed yesterday proved it beyond any doubt. If you visit The Beer Junction in West Seattle with any regularity, you may recognize two of Best Of Hands’ founders: Gregory Marlor, and Nicholas Marianetti (both are level II Certified Cicerones®). They both worked at The Beer Junction before leaving recently to launch Best Of Hands with their partner, Chris Richardson. The Beer Junction was also the first place to tap Best Of Hands’ Phantom Boots IPA last month. March is here. That’s a big deal to college basketball fans. Not that I’m a big college hoops fan, but you’d have to be in a coma to now know what March Madness is. 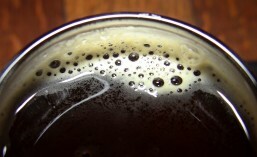 Traditionally, however, March doesn’t mean much of anything special to craft beer drinkers. Machine House Brewery wants to change that and give craft beer drinkers a different reason to be excited for March. Back again this year is their annual March Mildness event, taking place at a number of craft beer locations around the Sound. Drink up plenty of Machine House’s Dark Mild and win prizes. I love Washington beer. We have some truly incredible breweries here in Washington state; some of the best in the nation in my humble opinion and, while I try to drink local as much as I can, I don’t limit myself to drinking beers from Washington exclusively. Our neighbor to the South, Oregon, also has some of the nation’s best breweries and I enjoy beers from them regularly. Some of my favorite Oregon breweries are from the Bend area, which is why I’m pleased to announced that dates have been set for the 2019 Bend Brewfest. This year’s festival will take place on August 15th thru the 17th in the Les Schwab Amphitheater. (WA) Happy Hour, Chuckanut Brewery & Kitchen 04/21/2019 at 4:00 pm – 6:00 pm 601 W Holly St Bellingham, WA 98225 (360) 752-3377 Join the folks at Bellingham's Chuckanut Brewery and Kitchen in the bar and patio for Happy Hour. Discounts listed inside the Kitchen. (WA) Happy Hour, Chuckanut Brewery & Kitchen 04/22/2019 at 4:00 pm – 6:00 pm 601 W Holly St Bellingham, WA 98225 (360) 752-3377 Join the folks at Bellingham's Chuckanut Brewery and Kitchen in the bar and patio for Happy Hour. Discounts listed inside the Kitchen. (WA) Top it Off Tuesday, Elliott Bay "West Seattle" 04/23/2019 Elliott Bay Brewery - 4720 California Ave SW Seattle, WA 98116 (206) 932-8695 Our West Seattle pub is rolling out a new beer promotion this month. TOP IT OFF TUESDAY will make pitchers of House Beers available for just $9.00 ! Drop in for your fill of our fine ales and lagers. (WA) Happy Hour, Chuckanut Brewery & Kitchen 04/23/2019 at 4:00 pm – 6:00 pm 601 W Holly St Bellingham, WA 98225 (360) 752-3377 Join the folks at Bellingham's Chuckanut Brewery and Kitchen in the bar and patio for Happy Hour. Discounts listed inside the Kitchen. (WA) Kolsch Night, Chuckanut Brewery & Kitchen 04/23/2019 at 6:00 pm – 9:00 pm Chuckanut Brewery & Kitchen - 601 W Holly St Bellingham, WA 98225 (360) 752-3377 Join the folks at Bellingham's Chuckanut Brewery and Kitchen each Tuesday for $1.50 glasses of Kolsch. Available in the bar only, 6:00 til close.